Meeting the healthcare needs of the diverse rural and urban border communities is a persistent challenge. This is due in large part to a lack of local resources and geographical proximity to specialized medical expertise. 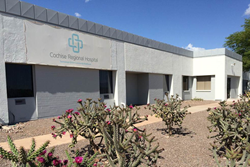 Cochise Regional Hospital (CRH) is treating this challenge as an opportunity and recently introduced telemedicine to provide clinical healthcare at virtually any distance.